The “craft beer” phenomenon has certainly caused a stir in recent years and following an interesting article from The Drinks Business on how this boom in craft brewers has impacted quality, we felt it was our time to comment! Clever marketers have helped to drive demand for craft beer as if it was a new invention, when in actual fact brewers both big and small have been crafting away for centuries. The down side of this “craft beer boom” is the increase in poor-quality products and lack of consistency, which is accepted under the term “craft”. This is something that is really damaging for good brewers that pride themselves in committing to continuous improvement. The “boom” has also meant that you’ve got some breweries putting out a new style every week. Variety is brilliant, but only if the consistency remains at a high quality and this seems to be lacking in recent years. It’s astonishing how murky looking beer (that is neither a wheat nor a saison nor intended to be hazy) has become acceptable. We’re at a point now where the market has almost reached saturation point which will inevitably have an impact on overall quality and the commercial viability of parts of the industry. This is part driven by the craft hype and part driven by the craze for the American ‘hop forward’ styles (where the over hopping of beers was traditionally used by some of those breweries in America to hide their errors) and which is being impersonated by some of the newcomers here in the UK. Ultimately whether the brewer is big or small and producing their own variant of ‘craft’, whatever that may be, then both quality of product and sustainability of the industry must always come first for both brewers and retailers alike. 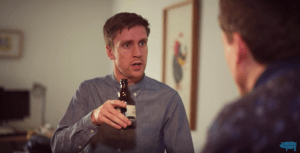 We recently came across a brilliant comical take on the recent craft beer revolution from trio, Foil Arms and Hog. Their take on the craft beer revolution says it all, check it out here: bit.ly/2q9SAvv or click below!